Eugéne Green's Le Fils de Joseph is a Bible film but, crucially, neither a biblical epic nor a typical modernisation of the Nativity accounts. Instead of taking those two more well-trodden routes it opts for a different approach that is quite distinct from any other biblical adaptation I can recall. Instead Green's film explores the story via a modernised story of Vincent a teenage boy who begins the process of discovering who is father is. Whilst for a moment Green toys with his audience to suggest that there might be some kind of supernatural element to his birth, it quickly becomes apparent that, far from being divine, his father is not even a particularly good human. At the same time Le Fils de Joseph is far more than just an off-beat modern-day story with familiarly named characters. Instead it examines issues of fatherhood, divinity and parentlessness on a number of different levels, enhanced by a technical formalism which underpins these different elements. This is a relatively unusual formal element, made all the more notable by the fact that two of these intertitles are named after the story of Abraham and Isaac, and one after the Israelite's exodus from Egypt, rather than Mary and Joseph. They're also one of a number of ways in which the film references the work of Jean Luc Godard, whose own modernisation of the Nativity, Je vous Salue (Hail Mary, 1985) was a more straightforward, and perhaps less successful, adaptation of the narratives about Jesus' birth. Other formal elements of the piece however would appear to owe more to the work of other French filmmakers, most notably the work of Robert Bresson, whom Green acknowledges as a major influence.1 The second aspect, and perhaps the one that has been most remarked on by reviewers, is the manner in which the characters frequently speak or stare directly into the camera. Whilst not a few films allow their leading characters to speak into the camera, it is relatively rare that the majority of the lead characters do so. Interestingly, this is done in such a way that leaves the question open to interpretation as to whether the characters/actors are meant to be aware of the camera. There are no Alvy Singer / Frank Underwood moments when characters knowingly address the camera, but at certain times, certain characters seem to sense it without specifically interacting with it. This technique itself brings a level of meaning; the viewer observes from a position with some echoes of divinity - on the one hand present yet unable to intervene or interact with the characters. Likewise the characters sense our presence but do not interact with us. Finally, by keeping the actors' relatively stationary, Green is able to repeat the same sequence of shot types numerous times throughout the film, most notably for dialogue where he typically starts with a mid-length two shot of the characters, before alternating over-the shoulder shots which gradually edge forward until they become close-ups. Often the sequence will end up on a mid-shot again, without the characters appearing to have moved. 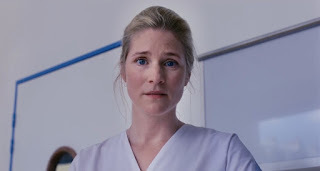 Alternatively the sequence ends on a close up that is held for several seconds with the character starring into the camera. These techniques are consistent throughout the film and, as we have seen, provide one of the levels with which the film addresses its themes. The other levels, however, appear less consistently and in many places intersect with one another. The most obvious of these is the plot. Vincent has been brought up by his mother, Marie, in the knowledge that he doesn't have a father. One day however he opens Marie's desk and find a letter she sent to his father that was returned. When Marie refuses to give him any more details he tracks down his father, Oscar Pormenor, who is now a successful publisher. Later Vincent sneaks into Oscar's office, witnesses first-hand his father's philandering and disregard for his other children, and proceeds to attack him. But in fleeing the scene he has a chance encounter with Oscar's brother Joseph. The two become friends and together with Marie they flee to the country. Given this is a film about Mary and Joseph made by a Bresson fan it's perhaps no surprise that the final, and most iconic, scene features a journey with a seemingly watchful donkey. Attached to this basic structure are a number of individual conversations, particularly in Act i, which revolve around different facets of absent parents, in quite oblique ways - one of Vincent's friends is selling his sperm on the internet; his mother, who is a nurse, has to care for a young girl whose father has just been killed in a car accident; Vincent's father has obvious pride in his literary son, writer Mathieu Orfraie; Oscar and Joseph's conversation about their own judgemental father; Vincent and Joseph have various conversations about the biblical characters Joseph ("Through his son he became a father") and Abraham ("God didn't ask him to [sacrifice his son]. The voice he heard was his own. "); and the pair watch the performance of a 17th century song written after the death of the author's son. Then there are all the small almost incidental references the film makes. Most obviously in this respect is the naming of Vincent's mother as Marie and of his "adopted" father Joseph. But many more exist far more fleetingly. Early on a shop banner reveals its name to be Pere & Fils, Orfraie's book is called "The Predatory Mother". Then there's the way that when Vincent first spots Pormenor he is wearing a red scarf and later on in the film Vincent mirrors that by wearing one himself. In a later scene Green captures a two shot of Vincent and Joseph both with the sweater tied around their neck in identical ways (above) - they are a mirror image, but together and now united on the same size. When the scene ends Vincent takes a long stare at this image, which we are given as a point-of-view shot, and at the end of the act we see a shot which superimposes Vincent putting handcuffs around his wrists in the foreground with the Caravaggio in the background. Clearly the image forms part of his motivation in the following scene for his attack on his biological father. Pormenor, like Isaac, is bound (by those same handcuffs), gagged (using the aforementioned red scarf) and laid horizontal awaiting an attack that never comes. Vincent brandishes his knife and seemingly has every intention of going through with it (below). The only difference, aside from the role reversal, is that the angel that prevents Abraham from striking in Caravaggio's work is not depicted in Green's. Similarly, the second act - named "The Golden Calf" because it has become clear that Oscar cares far more for his literary prodigies than he does for his biological children - ends with another point-of-view shot of the painting. This time the camera moves slowly leading the eye towards Isaac's distorted face before panning back towards the angel and then back again to ending on a close up of the knife. The camera works in a similar fashion when the scene is re-enacted by Vincent, only rather than taking it in one continuous shot, Green uses cuts, making the experience more abrupt and shocking and replaces the angel with a shot of the closed door. Of course, whilst the title and subject matter of the film may prime the audience to expect Vincent to be a Christ figure, this scene confirms that this is not Green's intention here. Not only is this not how a Christ figure is expected to behave, but the film makes no explicit attempt to link Vincent to Jesus aside from the names of his mother and his adopted father. Whilst early in the film Marie says to Vincent "You have no father." it soon becomes clear that this is not meant in a literal sense. Furthermore there are no Christ figure poses, halos, sacrificial acts, pseudo miracles or people revering Vincent in some way, indeed quite the reverse. In the film's opening scene, Vincent leaves two of his friends as they torture a rat. One asks where Vincent has gone. "He's weird." replies the other. In the next Vincent takes a long walk straight towards the camera in a shot laced with an ominously meaningful-looking aura. But just as he opens his mouth, as if to make some profound utterance, a passing cyclist accidentally clips Vincent's rucksack and the profound moment is gone. This is not what audiences of biblical films have come to expect. If Vincent is not to be associated with Jesus, then it's tempting to align him with Isaac. Jesus, of course, had no earthly father; Isaac may have wished he also had not. Both were children who were subject to their father's desire for sacrifice. The use of Caravaggio's painting and the titles of acts i and iii ("The Sacrifice of Abraham" / "The Sacrifice of Isaac") may suggest that this is a more of a role reversal however with Vincent, the abandoned son, taking revenge on his errant father. These themes sit neatly alongside the two other paintings that feature prominently in the film. Indeed for Ben Kenigsberg of the New York Times, Green's films "draw as much on architecture, paintings, music and theater as on cinema".4 In the fourth act Joseph takes Vincent to the Louvre where the pair are shown looking at Georges de La Tour's "St. Joseph the Carpenter" and Philippe de Champaigne's "The Dead Christ on his Shroud". The first portrays Joseph (who bears a striking resemblance to the Abraham of the Caravaggio painting) with a young Jesus in his carpentry shop. As the filmic Joseph explains to Vincent the drill is in "the shape of a cross, to remind us how Jesus will die". The second shows us the aftermath of the crucifixion with the dead Jesus stretched out, his sacrifice complete. In the latter image Jesus' hand rests on his loincloth as if to draw attention to his 'humanity'. Throughout his career Green has been heavily influenced by the Baroque period and the idea of the hidden God who only appears "in certain moments when the natural moments of nature were suspended".5 Much of his interest, which goes back over to 40 years ago when he founded le Théâtre de la Sapience partly to perform Baroque productions, lies in the manner in which Baroque thought "gives a possibility to live in the modern world with a spiritual life".6 In addition to the three paintings that are so prominently featured, then, there is also a pivotal scene where Joseph takes Vincent to see a piece of Baroque theatre. After the trip to the Louvre the pair enter a church where a classical singer accompanied by a lute perform a version of The Lament of Euryalus's mother from Virgil's Aenid.7. This time it's an expression of another parent-child relationship a mother expressing the loss of her son. It's significant, then, that in the next scene Vincent is seen at home in his mother's company for the first time since Act 2. Having returned home Vincent decides to introduce her to his adopted father. The funniest scenes revolve around the literary world which Green, as an author of books has experienced first hand. In particular the scenes at the launch party for Mathieu Orfraie's book which satirises literary reviewers in much the same way Denys Arcand mocked film and television critics in Jesus d'Montreal. Vincent, for example, meets one self-aggrandising critic who, assuming he must be an author, proceeds to tell him how Oscar has told her he is "brilliant". It's not only a swipe at literary criticism, but it also reminds us ironically that Oscar has not even acknowledged his son Vincent, let alone made plans to publish his novel. Oscar is a comic-tragic figure. Despite having no interest in his children and cheating on his wife, Oscar believes himself to be "a man of principle", merely bored by the "details" of how many children he has. His chief principle however seems to be refusing to help his, once-errant, brother. It's a judgement that prompts Joseph's to reply "I hope you reap the fruits of your virtue", (a prophecy is fulfilled just moments later when Vincent knocks him to the ground and puts a knife to his throat). "Pormenor" is an ironically chosen name which translates as "details", which Green has explained is because whilst "he thinks that everything that's important is a detail" ultimately it is he who "turns out to be a detail".12 Significantly, we are told that Joseph did not take this surname, and that neither did Marie give it to Vincent. Since Oscar is Vincent's true father who leaves a man called Joseph to do his fathering for him, it raises the question of whether Oscar is meant to represent God. Certainly the distant father who having brought his child(ren) into existence then has nothing to do with him (them) close to the deist idea of a non-intervening god which is so critical to deist thought. However, whilst he may be the biological father of Mary's 'fatherless' child, that child, as we have seen above, is neither a modernised Jesus or Christ figure. Green's films are marked by this love of paradox and ambiguity. 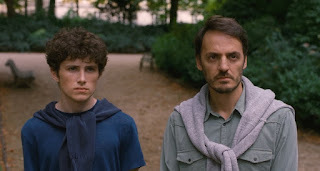 As Green himself has said, “Cinema is the place where the materiality of the world and the sacred, the visible and the invisible meet”.13 It's a quote that goes back to at least 2014's La Sapienza but it deftly captures the paradoxes and contradictions that lie at the heart of Le Fils de Joseph. It's a film where the world that is portrayed is not quite the world we live in. Instead its a world that tells us far more about our own world and makes us yearn to meet the hidden God even if only at the end of our journey. The Canon in "the Golden Era"